Psypoke - View topic - Oh my goodness the water guy is revealed! Oh my goodness the water guy is revealed! haha ok maybe this was just one of my alternative interpretations from the silhouettes. The reason I made this piece is to offer an alternate point of view of what the silhouettes could be because I know 90% of you were thinking that the "beak" on this pokemon is really the arm, etc. Of course, I find it highly unlikely that this sample will even vaguely resemble the physiology of the actual starter! Re: Oh my goodness the water guy is revealed! OH MY! I was not expecting that! Ahaa, thats brilliant, please do the other two. It would be really good to see what you made of them. But you have a point, people should stop assuming things about the silhouettes. interesting?? most definitely. it appears as though that actually is a dolphin, if i'm not mistaken. and a grass teddy bear, and a fire bug thingy. definitely better than what the silhouettes revealed (these are the starters, rite?? if not, then sorry). can you maybe take some close-ups? are those real, I hope so we get a panda bear for a grass starter. Not my magazine I'm afraid, I can neither conform nor deny any of these are the starters. Although they are legit. Wow, Koony. Really? That's definitely NOT legit. 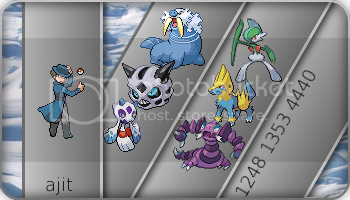 the LEGIT Pokemon were revealed on POKEMON SUNDAY, this last weekend. It looks well done, but not legit. Also, Ajit. I think the water starter is a Beaver. You should try that. It's a nice attempt, but it's obviously fake and that's why I merged the topic with the one about a fake revelation of the water starters. No other Pokemon site on the internet has confirmed that Corocoro has leaked yet, and the only one of the Pokemon in that magazine scan that resembles any of the silhouettes at ALL is the Grass one. The other two are completely different body shapes and poses.